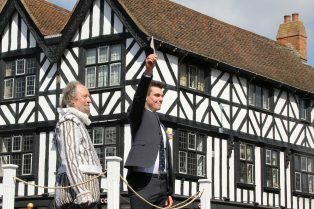 Stratford-upon-Avon has been celebrating William Shakespeare’s birthday with the world since the 19th century and this tradition has grown in scale to the present day. The celebrations now involve representatives from the world of literature, theatre, academia and diplomacy and attract both national and international media attention. There are many ways that you can help to secure the future of Shakespeare’s annual celebrations in the town where he was born, raised, schooled, married, retired and ultimately buried. We want to ensure that this priceless tradition continues to bring knowledge and pleasure to people across the world, and grows and develops in exciting, creative and innovative ways. Everyone can help to make a difference, whether it be by making a financial contribution, volunteering your time, or just participating. With your help, Shakespeare’s Celebrations will continue to develop and flourish and increase the benefits it brings to all the people that they reach. The potential benefits of supporting the celebrations are far reaching, not just because of the breadth of its cultural significance but also because of the exposure offered by world- wide media coverage. We remain committed to creating a sustainable future for the Celebrations and have an exciting and comprehensive range of means that make it possible for everyone to lend a hand or participate in this highly valued and popular event.